One of the problems that the rising price of crude has created lies with the related cost of asphalt. As a result states are being more creative in spending their repair budgets, and it is interesting to see some of their answers. Asphalt is used extensively in creating the roads that we drive over every day. Because of this traffic, and movement of the underlying material, roadbeds can fail and erode. But not all do, at least to the extent of the majority. Just this last week the Asphalt Pavement Alliance has announced the winners of this years Perpetual Pavement Award. The winners have to be the owners of asphalt pavements that are at least 35 years old and have never had a structural failure, and the average time between resurfacing has to be no less than 10 years. There are ten awardees, with sections of highway that won being found in Alabama, Arkansas, Kentucky, Michigan, Minnesota, Mississippi, Missouri, Nebraska, South Carolina and Tennessee. The winners range in length up to 12 miles, and from Interstates to State Roads. Asphalt has been getting more expensive, as the price of crude oil increases, and this reflects back to the state highway departments that must repair damaged roads. In Illinois, for example, the average asphalt overlay will last between five and eight years (Illinois State Toll Highway Authority) or eight to fifteen years (Illinois Department of Transportation). The decision on repair is a function of both the amount of damage, and the amount of traffic. One consequence of this is the return from asphalt coated to gravel roads. Ugo Bardi recently commented on this at The Oil Drum. He noted that an early use of the Canadian Tar Sands was as a direct application as a roadbed material, and the same has been considered for the West Indies. Asphalt is one of the most re-circulated of materials, since the material that is laid into the roadbed is only about 5% asphalt and 95% aggregate, so that when the original surface is removed as part of the resurfacing operation, about 80% of it is recycled. And it is not just the aggregate, and some of the binder that gets recycled. Starting in 1994 Florida DOT has also mandated that the mix include recycled ground tire rubber. From 1994 through 2007, Florida has recycled the equivalent of over 12.5 million passenger tires into asphalt pavements, saving valuable landfill space while improving the performance of our highways. That works out to over 471 passenger tires per lane mile. Current research shows benefits of combing both ground tire rubber and high tech polymers to improve asphalt binders even more. Because of the changing price of oil, most states have an adjustment index for the price of asphalt that their construction contractors buy (and then charge the state for). Some states are returning roads back from asphalt to gravel, though this is not as easy as it may at first appear, since the construction of the roadbeds is different, as is the maintenance, since a gravel road is graded back to quality, rather than being ground up and resurfaced. This is particularly true when road traffic is light, but a number of states are moving this way because of budget constraints. Thirty-eight counties in Michigan replaced a total of 100 miles of asphalt roads with gravel because of decreasing funds in 2008-09, said Monica Ware, a spokeswoman for the County Road Association of Michigan. In Montcalm County, Mich., 10 miles were converted to cut patching costs in 2009, said Randy Stearns, managing director of the county's road commission. He cited one road that cost a combined $39,244 in 2008 and early 2009 for patching, but only $7,300 to crush into gravel. More roads may be converted this summer, he said. 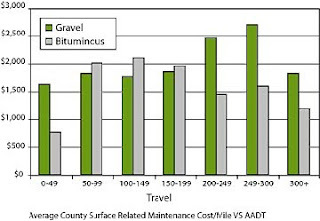 The relative costs of going from gravel to asphalt indicates that the transition comes at around 200 vehicles/day. Now the price of asphalt is anticipated to rise again, and so what are states to do? In Missouri, a state that grows a lot of pigs, – mainly in farms, though there is a concern over the rising numbers of feral hogs in the state. Putting the problem of disposing of a lot of porcine waste with the high cost of asphalt, folks in Missouri, at the highway leading into Six Flags at Eureka (just outside Saint Louis) have taken the logical next step. The witnesses lining the bright stretch of North Outer Drive along Interstate 44 — particularly those with noses and an abiding interest in sustainable technology — won't soon forget the moment the red dump truck deposited a 15-ton load of the designer asphalt into a road paver late Wednesday morning. "Whew!" gasped a worker with Pace Construction Co., the St. Louis County road contractor that joined forces with Innoventor, the Earth City-based engineering and design firm that perfected the process of converting the animal waste into a bio-oil used in asphalt binder. To others, the air swelled with the sweet smell of potential for new manufacturing opportunities, jobs and, possibly, profits. The initial stretch of road treated was some 500-ft long, and will get a significant seasonal traffic from the amusement park, accelerating wear potential and allowing the evaluation to be made in a shorter time. The process was thought up and developed through Innoventor. Essentially the animal waste is converted into a bio-oil that can serve as the binder in the asphalt. The program is currently getting the close attention of the Missouri Department of Transportation, as well as the U.S. EPA. (And I suspect that the next time I drive by the site, I may roll down a window and have a quiet sniff). It takes all kinds, to find the right answers. I'm sure the words "15-ton load" were not chosen by accident.